You�re viewing our Sausage Maker soy protein concentrate � 5 lbs. TSM's soy protein can be used in smoked or cooked sausages, the concentrate binds fat and meat to create a smoother sausage consistency. The concentrate improves moisture retention and cuts sausage shrinkage in the smokehouse. 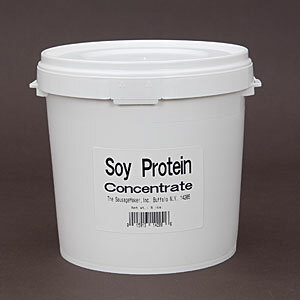 TSM's soy protein concentrate contains seven times more protein than meat. The concentrate is perfect to add to lunch meats and smoked or cooked sausage. Use 1 lb. 12 oz. of the concentrate to process up to 50 lbs. of meat or sausages. Measure 1 cup soy protein concentrate for each 5 lbs. of meat, do not pack the concentrate when measuring. Use 5 lbs. 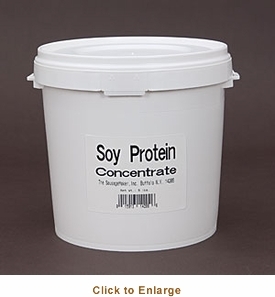 of TSM soy protein concentrate to process up to 140 lbs. of meat. We can answer any questions you may have about our products. Scroll down to view our Sausage Maker soy protein concentrate � 5 lbs.